TEMPLE, TX — Temple police are investigating after a rock was thrown at a vehicle on Monday. According to police, the report came in at approximately 3:16 p.m. They said that a driver threw a rock or a brick at another vehicle on SE HK Dodgen Loop. An officer met with the driver of the truck to file a police report. Chris Rance, the owner of First Call Auto Recovery in Temple, said one of his drivers was driving east on Dodgen Loop when someone in a black Dodge Charger, driving the opposite way, threw a rock at his windshield. Rance said the vehicle received minor damage. It busted the lower driver's side of the windshield. 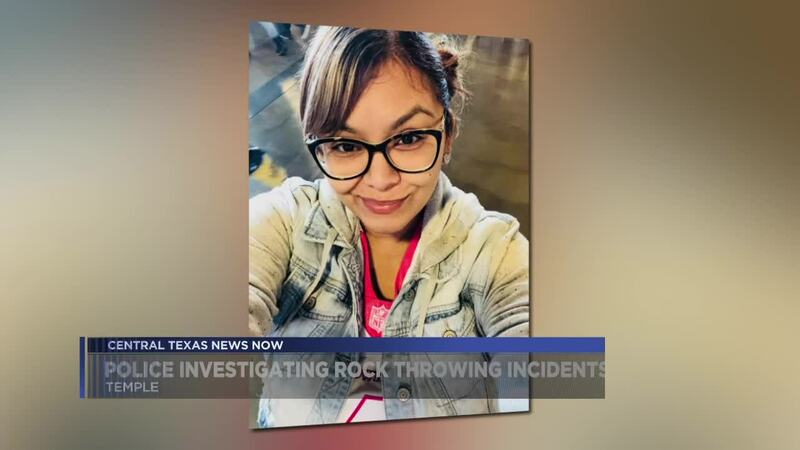 On March 10, 33-year-old Keila Flores died due to a rock that was thrown off an I-35 overpass in Temple. Police said the rock broke the windshield of the moving car and hit Flores who was in the front seat. Another rock was thrown from a Temple overpass on March 12 . Police believe it was thrown off of Nugent Avenue near exit 302. The rock did hit a moving vehicle, but there were no injuries. The rock hit the sunroof of a Volkswagon GTI. Police said they are still looking for more information on the incident.